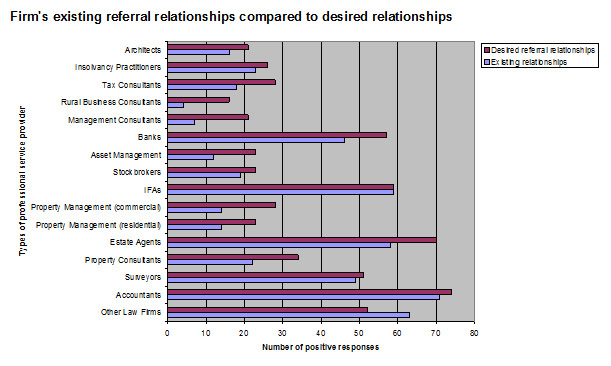 Last month I wrote about the importance in managing contact with clients this month we are going to look at a vital part of income generation that of informal referral relationships (mutual benefit rather than referral fees). After looking at this piece I hope there is sufficient stimulus for you to at least review your stance on this topic. The conference division of CLT has very recently conducted a market research project ahead of a new initiative and the statistics are the result of more than 100 law firm responses with a wide spectrum of size. The first surprise is that 50% of firms rely on referrals for more than 10% of their fee income with 5% confirming more than 50% of fee income. Do you know the value of business by work type that comes from referral and what could the impact be if that was doubled or trebled? The impact on profitability for the firm could be substantial with a small % increase in fee income. 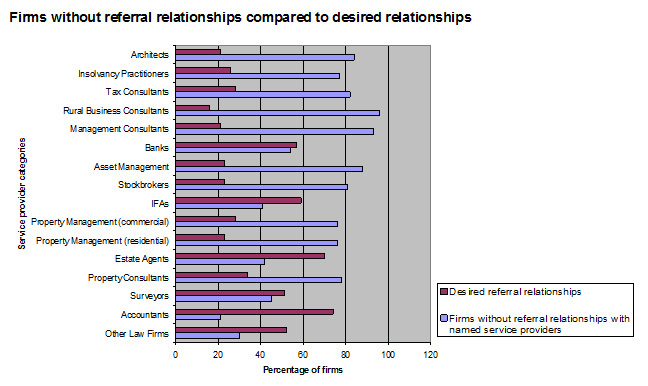 Firms were then asked where they had informal relationships and where they would like relationships and again the breadth of potential referees is surprisingly wide. The other way of looking at it is where there are no informal relationships and where such relationships may be desired. I would suggest again that you look to your management information and see if all the bases are being covered. There are also other categories such as undertakers, trust companies and even social services. Obviously good relationships like this don't just materialise and need to be part of a plan and a delegated accountability for partners, marketing personnel and any "rainmakers" that the firm may have. Methods used have been through organisations such as Chamber of Commerce (30%+), historic relationships with local providers (75%+), being approached by another party (40%+), meeting at networking functions (70%+) and finally only 26% taking proactive steps in this area through research and specific targeting. So again look at your own firm and see if being proactive can help you but as a minimum make sure that partners are briefed on how to communicate at networking events and make sure that they come back with sufficient information to allow follow up. The sort of information that is generally gathered is 1, information on specialisation 2, information on key individuals, 3, client testimonials, 4, information on client lists, 5, company/firm background information and 6, credit check. 60% of existing referrals come from the immediate catchment area, 40% county wide and just 25% national - so not so far to travel and with the opportunities is mind then a coffee with the local accountant or planner can be a little less tedious. To close - 2 years ago a survey said that only 3% of firms were considering MDP, the latest survey states that this figure is up to 33% as the LSA gains momentum so what better way is there to test the potential than a good programme and test run with strong referral networking. Contact me if you would like a copy of the results. Bill Kirby is managing Director of www.professionalchoiceconsultancy.com and director of www.managedservicesconsultancy.com PCC advises law firms on business strategy and planning and the effective use of IT.